In economics, cargo or freight refers to goods or produce being conveyed – generally for commercial gain – by water, air or land. Cargo was originally a shipload. Cargo now covers all types of freight, including that carried by train, van, truck, or intermodal container. The term cargo is also used in case of goods in the cold-chain, because the perishable inventory is always in transit towards a final end-use, even when it is held in cold storage or other similar climate-controlled facility. Larger items like small boxes are considered parcels or ground shipments. These shipments are rarely over 50 kg (110 lb), with no single piece of the shipment weighing more than about 70 kg (154 lb). Parcel shipments are always boxed, sometimes in the shipper’s packaging and sometimes in carrier-provided packaging. Service levels are again variable but most ground shipments will move about 800 to 1,100 km (497 to 684 mi) per day. Depending on the origin of the package, it can travel from coast to coast in the United States in about four days. Parcel shipments rarely travel by air and typically move via road and rail. Parcels represent the majority of business-to-consumer (B2C) shipments. Air freight shipments are very similar to LTL shipments in terms of size and packaging requirements. However, air freight or air cargo shipments typically need to move at much faster speeds than 800 km or 497 mi per hour. Air shipments may be booked directly with the carriers, through brokers or with online marketplace services. While shipments move faster than standard LTL, air shipments don’t always actually move by air. In the US, there are certain restrictions on shipments moving via air freight on passenger aircraft. Shippers in the US must be approved and be "known" in the Known Shipper Management System before their shipments can be tendered on passenger aircraft. Overall, shipping costs have fallen over the past decades. A further drop in shipping costs in the future might be realized through the application of improved 3D printing technologies. Chisholm, Hugh, ed. (1911). 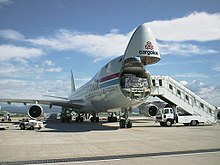 "Cargo" . Encyclopædia Britannica (11th ed.). Cambridge University Press. ^ CambridgeSystematics 1998, pp. 79. ^ "An example of a British commercial freight forwarding agency". Freightlink. Archived from the original on 10 February 2014. Retrieved 12 January 2014. ^ "Transportation is a crucial driver of economic growth and poverty reduction". The World Bank. Archived from the original on 30 June 2013. Retrieved 14 April 2013. ^ Durach, Christian F.; Kurpjuweit, Stefan; Wagner, Stephan M. (2017-09-25). "The impact of additive manufacturing on supply chains". International Journal of Physical Distribution & Logistics Management. 47 (10): 954–971. doi:10.1108/ijpdlm-11-2016-0332. ISSN 0960-0035. Cambridge Systematics (1998). Multimodal corridor and capacity analysis manual. Transportation Research Board. ISBN 978-0-309-06072-1.